Ashley Skinner has four canines in her mouth; all her other teeth are gone. Some unfortunate greyhounds have serious dental problems despite having the best of care. Most greyhounds benefit from regular brushing. Hopefully all Greyhound adopters reading this have had the importance of home dental care stressed to them by their adoption representative and their veterinarian. The big question is are you doing it? And if so, how frequently and how effectively? Why all the fuss about teeth? Dental disease can have a significant impact on your dog’s life span due to its affect on the heart, kidneys, liver and respiratory system. It starts with saliva, food residue and bacteria creating plaque on teeth which builds up along the gums, infecting the gums, bones and ligaments that support and anchor the teeth in the jaw. Some studies have shown that 80% of dogs over the age of two or three have dental disease. One of the hallmarks most of us are familiar with is doggie breath (halitosis). Periodontal disease is progressive, usually starting as gingivitis, an infection of the gum tissue. At this point the condition is reversible with proper care. It progresses to gum recession and eventual loss of teeth. Bacteria enters the bloodstream and can travel to your dog’s vital organs. Most likely your Greyhound had no formal dental care before retirement from racing. The large text Care of the Racing Greyhound: A Guide for Trainers, Breeders and Veterinarians devotes only one half page to dental care, and that’s in a chapter on geriatrics, stating that periodontal disease is “not an infrequent problem in the aging Greyhound.” Quite possibly your Greyhound already had periodontal disease when adopted and may even have had some teeth missing. Your adoption group may or may not have provided some dental care in its pre-adoption medical package. Six years ago I adopted two Greyhounds before our group included dental scaling and their dental status was quite different. The two-year-old dog’s teeth had very thick tartar build up, but no gum inflammation. Although he probably didn’t enjoy spending his second birthday at the veterinarian’s getting his teeth cleaned back to their original pearly white, it was a great investment in his health. The three-year-old dog’s teeth had a little tartar but he already had gum recession and bleeding with brushing. His teeth were also quite worn from crate chewing. Brushing is the most important aspect of home dental care. Brushing is the cornerstone for your dog’s home dental program. If your dog’s teeth have heavy tartar build up you can’t brush it off and a professional cleaning at your vets is needed to give you a clean slate to work with. Ideally your Greyhound should have its teeth brushed daily or at least every other day with toothpaste formulated for dogs. Don’t use toothpaste made for people or baking soda. Your dog can’t spit it out. Toothpaste for dogs that has poultry and beef flavors is available at pet supply stores as are rubber finger brushes and pet toothbrushes. I previously used a soft toothbrush for people until I switched a year ago to using a Sonicare toothbrush on my Greyhounds. Automated brushing devices have made home dental care easier and more effective for people, so why not use them on dogs also? The Sonicare toothbrush, with 31,000 strokes per minute not only dislodges bacteria from the tooth surface it helps remove plaque between teeth and below the gum line. Due to its noise and vibration, the Sonicare needs to be introduced slowly and carefully to be accepted by your dog. One of my Greyhounds bolts at unexpected noises but within two weeks both dogs became quite accepting of having this machine in their mouths. I started by using the Sonicare to brush their teeth without turning it on, then with the dampening ring in place turning it on for a few seconds in the front half of their mouths. Using this technique a friend has also gotten her Greyhound used to this toothbrush. Hold your toothbrush at a 45° angle and focus on the point where the gums meet the teeth. I brush the outer surfaces of all teeth and the insides of the bottom front teeth and canines, applying toothpaste two or three times. Dogs’ tongues are good at cleaning the insides of most of the teeth. I’ve heard a number of people say their Greyhounds won’t let them brush their teeth. Dogs like the taste of poultry and beef flavored toothpaste so I wonder how hard they have tried. I believe that if the dog is introduced to the process gradually it will accept it as a regular activity. I think the greatest challenge of brushing is to keep the dog from licking all the toothpaste off the brush. The first time I stuck a toothbrush back in my newly adopted Greyhound’s mouth his eyes opened wide and I thought he might bite me. A slower introduction to this new experience would have been prudent as we didn’t know each other very well then and he wasn’t a puppy. Letting the dog lick toothpaste off your finger and rubbing his teeth and gums at the same time would be a gentle introduction to the process. I’m not aware of any veterinarian who recommends flossing dogs’ teeth, (it’s hard enough to get people to follow through with brushing), but I thought that if flossing is an important part of human oral hygiene, why not canine also? Many years ago when Minnie the dental hygienist told me I had “floppy gums” from not flossing, I became a flossing advocate. Brushing alone, even with the automated brushes, has limited capacity to get between the teeth where food and bacteria can accumulate. The Dentax Flosser I occasionally use for the Greyhounds was purchased at a chain drug store and was basically designed as a one-handed device for people. It looks like a little plastic sling shot with a roll of dental floss that is strung between the two ends. I focus on the dogs’ problem areas: for one I floss between all the little front teeth and with the other I’ve used it between his molars. I used to scale my dogs’ teeth and am evaluating the pros and cons of this. The veterinarian who has been working with our adoption group for five years is becoming board certified in dentistry and is not an advocate of home dental scaling. Without anesthesia it is not possible to clean thoroughly under the gums. Without polishing, the microscopic scratches on the teeth created during the cleaning process will quickly fill in with plaque again. Because I kept the teeth of my Greyhound with periodontal disease looking decent through home scaling, my general practice vet deferred regular professional cleanings. At age nine I had his teeth done with the dental vet. Full mouth x-rays showed five teeth to have root loss from the disease process and were extracted. In an attempt to save two other teeth that had pockets of periodontal disease, two healthy teeth of lesser importance were also removed to make more space. Flouride was applied to his teeth to strengthen the enamel, inhibit the growth of bacteria and desensitize the surfaces of teeth where gums have receded. Would he have lost these teeth if he had had regular professional cleanings? We don’t know. Greyhound adopters should feed their dogs a dry kibbled food. Soft food tends to stick on teeth, promoting dental problems. Even with dry food you may find food remains on the back teeth, trapped by the cheeks. After a meal take a look. You may need to massage the dog’s cheeks or brush to help dislodge trapped food. Your veterinarian may also recommend a food that was designed to help reduce dental plaque. I’ve heard some trainers give bones to Greyhounds in racing kennels for mechanical abrasion of the teeth to help remove tartar. Two veterinarians I know advise strongly against giving your dogs bones. Considering the power of dogs’ jaws, they may break teeth or shave off bony splinters that can cause injury to oral and esophageal tissues, GI upset and lethal perforations of the stomach and bowels. Rawhide chews are promoted to aid dental care but their use is controversial as dogs may choke on them or they may cause intestinal obstruction. Depending on your dog’s dental status your veterinarian may recommend an antibacterial canine mouthwash or some newer products to help control periodontal disease. Proper dental care for your Greyhound is essentially a joint effort between you and your vet. Professional cleanings will be required for optimal dental health. If you are not already on a home dental regimen for your Greyhound, please look in your dog’s mouth today. What you see may surprise or even alarm you. Red, inflamed gums and teeth brown with tartar are two signs you need your vet’s help before starting on a home dental program. 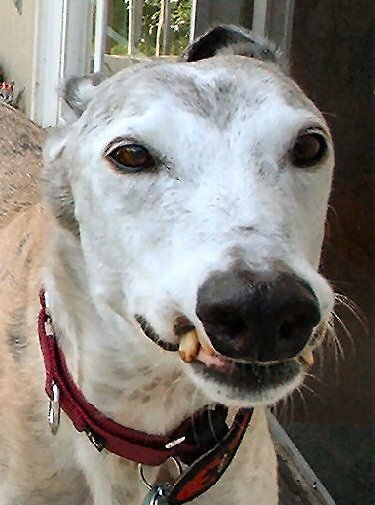 I’m aware of a number of adopted Greyhounds whose dental care was neglected, resulting in the extraction of twenty or more teeth — that’s half of a Greyhound’s teeth. Consider that if you had a toothache you’d probably call your dentist right away, but your dog has no way to directly communicate dental pain and essentially suffers in silence. Your dental care efforts will help control the dreaded doggie breath and you will be rewarded by having a happier, healthier Greyhound companion. * See comment area for current info. “The Importance of Dental Hygiene to the Health of your Dog,” Heska Corp. Since this article was written, some wonderful products have been put on the market. Petzlife gel and spray do a wonderful job at taking plaque off teeth and at keeping it off. (The webmistress uses these products on her hounds. The company has just created a version for people too!) Some people have better luck with Leba II. Others use products that are put into drinking water. Good old enzymatic doggie toothpaste works well for many too. Enduring bad breath despite daily brushing frequently indicates bad teeth. The first teeth to go bad in our dogs has always been the lower incisors. They are tiny but if decayed, cause major bad breath. We suggest you look there first if your dog has horrible breath.